We have alternatives. Energy and electricity—while it improves our lives immensely—comes at a high cost to our health. The way in which electricity is currently generated, mainly through burning of fossil fuels, is a major contributor to climate change and pollutes our air, water, and soil. Significant reductions in illness and deaths can be achieved if we switch from dirty fossil fuels to renewable energy—that’s where you, the health professional, comes in! 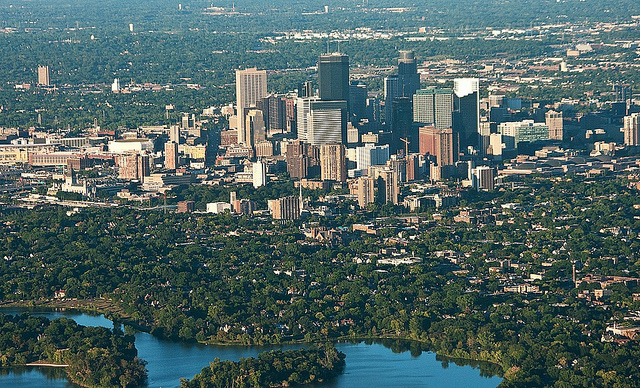 We need your prominent voice in energy policy conversations. 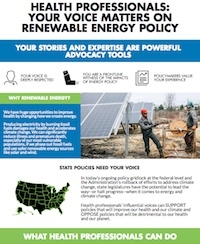 As a health professional, you have an important voice to bring to state energy policy conversations. You witness the health impacts of energy policy (e.g. treating asthma attacks exacerbated by air pollution from burning fossil fuels or preparing emergency response plans for extreme weather events due to climate change) and your professional experience and on-the-ground stories are the best advocacy tools you have to influence decision-makers. We’re here to help you use the experience you already have to support healthier policies. We’ve created two quick reference tools to help you figure out where to start, and to give you tools to share with others. 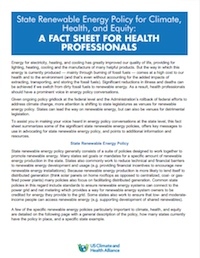 The fact sheet below includes a brief overview of state renewable energy policy, examples of policies to support and oppose, and key talking points to use in advocating for health in energy policy. Whether you’re having a casual conversation with a co-worker, meeting with a legislator, writing an op-ed, or educating others about this issue, the fact sheet gives you background and content to use. It also summarizes some of the significant state policies and procedures. The infographic gives you a more general visual representation of why health professionals need to be involved in renewable energy decisions. This is a great tool to share to spread the word on this issue and to talk about how you’ll be taking action. See our Advocacy Tools page to get started, where you’ll find examples of op-eds, keys to testifying effectively, and much more.